Silver futures managed to eke out modest gains on Monday after a more than 6% tumble last week to lows last seen early in 2010. At around $16.10 an ounce, silver is down 17% this year and nowhere near the contract high of just over $48 an ounce in April 2011 (or the Hunt-induced spike to $48.70 in 1979). Capital Economics is not alone among analysts expressing surprise at the weakness in the silver price this year "given that industrial metals prices have been more resilient and industry accounts for about 60% of global silver usage." 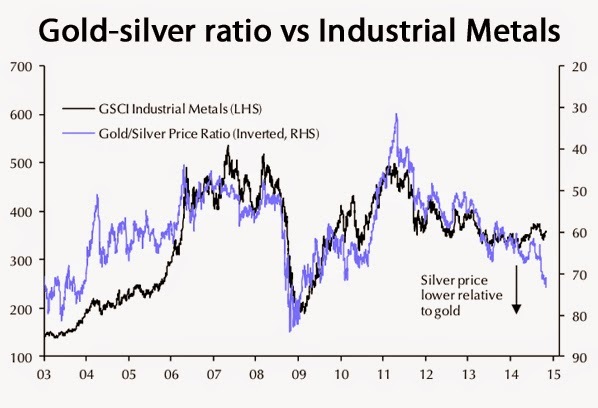 At around 73 the gold/silver price ratio is now close to levels last seen at the height of the global financial crisis and the independent researcher expects the ratio to be trimmed to a more normal 60. Capital Economics predicts a rise in the silver price to $20 an ounce by end-2015 and $23 by end-2016 and "with the risks on the upside."